Once again DERA has a number of entries in the DCC Neighbourhoods Competition. Judging takes place in June. Please help support our estate entry by keeping up the nice appearance of our community with special attention to grass, verges, shrubs & trees and try to have our area clean & tidy. Our DERA Environmental Team & Support Volunteers need all your help & support!! Work has begun on the Community Garden in Donaghmede Park, in cooperation with Dublin City Council and with generous support from local businesses. While progress has necessarily been slow over the winter months, there’s a lot of work ahead this year to bring the plan to completion. Selection of furniture and signage is under way, and a planning meeting with DCC will be held in the coming weeks. 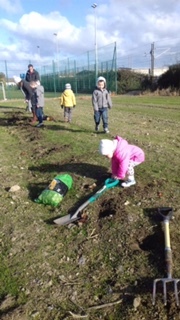 Our picture shows some of the younger residents of Donaghmede lending a hand with planting. The fruits of their labours should be visible soon, now that spring is in the air! We’d like to remind residents that bicycles, skateboards and scooters are not allowed on the all-weather pitch, to protect the surface from damage. Signage to this effect will be erected soon, and we ask parents to remind their children of this necessary rule. We are investigating the provision of a bicycle rack outside. We also remind residents that dogs are not allowed on the all-weather pitch. The pitch is a valuable resource, and it’s wonderful to have such an amenity freely available, so it’s in everyone’s interest to protect it. 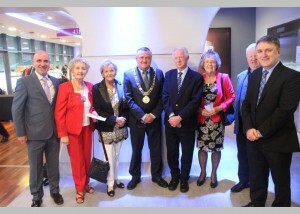 DERA also received awards for a section of Donaghmede Road and for “The Island” on Newbrook Road, in association with Donaghmede Shopping Centre. Other prizewinners in the local area included TARGET, Scoil Bhríde, Ard na Gréine Residents Association, and The Donahies Residents Association. We thank all residents who contributed to our success and congratulate our environmental winners on their achievements. 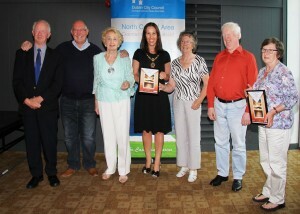 Photos of the North Central Area and Citywide prizegiving ceremonies are used courtesy of Dublin City Council. Once again DERA has 5 entries in the Dublin City Council Neighbourhoods Competition for this summer’s judging which takes place in June. We ask all residents to support our entry by helping in every way to attend to our local environment, with special attention to grass verges, plants, flowers and the protection of trees and green spaces in our estate. You can help by removing litter (always use gloves) and encouraging children and visitors to take a special interest in our environment. 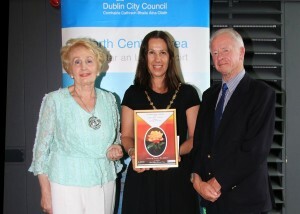 Last year DERA received 7 awards, including one citywide award, presented by the Lord Mayor of Dublin. Judging in our community takes place during June and July. Volunteers are always welcome to join the Environmental Team – please contact us for more information. PS. You may have noticed that DCC have installed a “talking lamp-post” in Donaghmede Park to remind dog owners of the part they can play in maintaining a clean and safe environment for all.